Anyone stunned by the trailer for Battle: Los Angeles (see below) might feel disappointed by the first half hour of the film. Gone is the inventive, emotive soundtrack (by Icelandic musician Johann Johannsson), replaced by standard issue military brass and snare drum. Accompanying the clichéd soundtrack is an introduction to worn-out character archetypes, including the virginal rookie, the nearly-married grunt and the over-the-hill officer who’s ready for retirement. Their mission: to rescue some isolated survivors in the wake of an alien attack on LA. The saving grace of the film is its collection of incredible set-pieces. 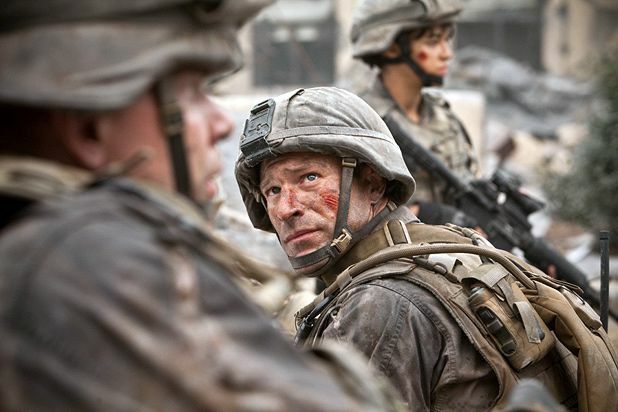 The cast, led by Aaron Eckhart, wear their boot camp training well, moving convincingly as a unit into each theatre of flying debris and (occasionally ropey) CG enemies. Their characters are so thinly drawn that it’s impossible to get attached to them, so when they’re lined up as cannon fodder, the audience is left free to enjoy the spectacle without worrying too much about who’s dying. From the colon in the title and the film’s semi-open ending, we can probably expect to see more Battles in the future (our money’s on New York next). If a little more effort is put into script development for later instalments, they could end up being great pieces of action cinema. What’s more likely, though, is this one making substantial enough returns at the box office, and Hollywood churning out more of the same. Out now on general release. Thanks to Omni Vue, Edinburgh.